Dak Prescott and Ezekiel Elliott led the Cowboys to an early 3 point lead, but Derek Carr and Cordarrelle Patterson would respond early in the second quarter with a touchdown. Carr’s night would end with another touchdown to Amari Cooper. Two late touchdowns thrown by Cooper Rush to Ronnie Hillman and Lance Lenoir would give the Cowboys the victory, 24-20. With that. we give you our PFF exclusive takeaways from the contest for each team. The 15-year vet was in mid-season form, hauling in all of his 6 targets for 74 yards and a touchdown. Witten and QB Dak Prescott were consistently on the same page, including on a 28 yard completion up the seam. The two later connected on a well designed play action pass in the red zone for a touchdown. Rush continued his solid play throughout the preseason, playing with the second-team offense and once again stating his case for the backup job. Rush finished with an adjusted completion percentage of 92.3 percent. Rush was on the lucky end of a dropped interception that ultimately lowered his grade. Moore made a living in the Raiders’ backfield as he earned a sack, a hit and a hurry, along with beating his man on several other occasions. He forced a fumble on QB Connor Cook to end a drive as well. 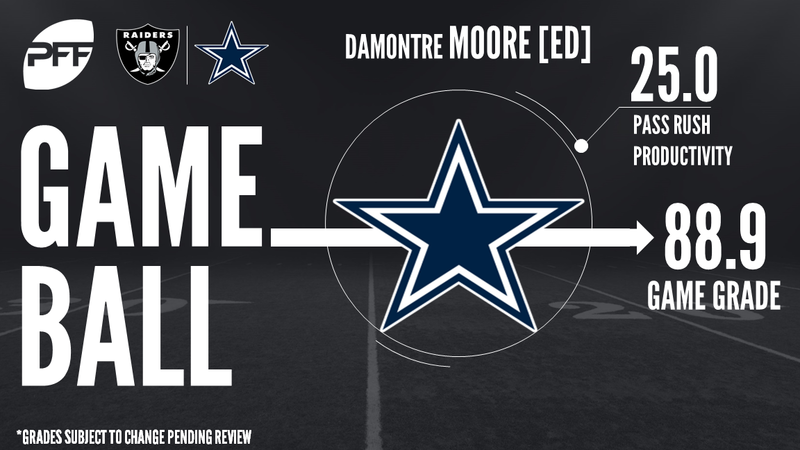 Moore has been a force this preseason racking up two sacks, three hits and two hurries on just 44 pass rush snaps. Collins performance was noteworthy from a run defense standpoint, as he made an impact with his disruption on just 11 run snaps. He recorded just 1 run stop but forced the running back to cut into a tackle for loss on another occasion against Gabe Jackson. Outside his one neutral zone infraction, Collins played an excellent game. QB Derek Carr targeted his No. 1 receiver early and often, doing most of his damage against CB Anthony Brown, where he caught two of three passes for 59 yards and a touchdown. Carr’s passer rating of 149.3 when targeting Cooper was easily a game high. Much of the first team offense didn’t have a noteworthy performance but the second and third teamers did but mostly in a bad way. Feliciano bucked that trend as he was solid on 34 snaps including a clean sheet in pass protection on 23 pass blocking snaps. The third-year pro out of Miami (FL) has yet to allow any pressure the past two preseasons and saw 46 regular season snaps in 2016. Luani was overall the field with 6 tackles and 5 stops on the night. In coverage, Luani allowed 2 catches for just 10 yards.